Yes, really. Since coming off the Cambridge Diet last October, I’ve put a bit back on… or a lot back on, depending on how kind I’m feeling about myself when I think about it. In total, I lost just over 4st (but didn’t reach goal before quitting) and have since put 1.5st back on and it’s still creeping. I don’t want it to creep, it would be so easy to let myself slide back up the scales. The fact is, I love food. I love food and I don’t care too much for exercise. True, I have a hormone imbalance which means that I’m slightly more susceptible to piling on the pounds just by looking at an unrefined carb BUT, that’s not to take away from the fact that essentially, I’m a greedy guts. In the past month, I’ve yo-yoed from famine to feast – knowing that this isn’t how I *should* be losing weight and it’s been (as I’m sure you can imagine) a rollercoaster of highs and lows as a result. It also means that whenever I treat myself to a couple of days off the famine, I’ve piled about 7lbs back on in 48hrs as my body retains both water and energy stores in an attempt to get me through the ensuing ‘famine’. This week, I’m making a few changes. I love my meal replacements, though I know that many will frown – and I will be replacing my breakfast and lunch with protein-based shakes. Because of my hormone imbalance, my sugar levels soar with porridge and cereals, and through personal choice (i.e. I can’t stop at one slice), bread is out. This leaves things like fruit and yoghurt and well, I don’t know about you – but I’d need to eat a LOT of fruit and yoghurt to sustain my appetite throughout the morning. As most meal replacement programs suggest, I will be limiting my evening meal to 600kcal – but I want to make those calories work as hard as possible. This week, I’ve been creating my evening meals based around a particular vegetable. It forces me to get imaginative and will hopefully expand upon the range of veggies that I eat in the future. Now, lectures about how to eat healthily aside (please), I thought I’d share with you the evening meals that I’ve been enjoying this week and the veggies that have taken pride of place each day! Spray a non-stick pan with oil and stir-fry the broccoli and red pepper over a medium heat until the broccoli begins to soften a little (about 7 minutes). If you feel that your pan is getting too dry, add a little water, about a tbsp at a time. Meanwhile, cook the brown rice – I always cook mine in the microwave, remember that brown rice will take longer to cook than basmati! Add the soy sauce, balsamic vinegar and cayenne pepper – giving the pan a swirl to coat the vegetables. Let cook for a further 5 minutes. Throw in the mushrooms and garlic and continue to cook until everything has softened to a firmness you like. Add the prawns, rice and pine nuts and loosely cover the frying pan with a lid to contain the heat for a maximum of two minutes. Serve! Not the most colourful dish in the world, but the fantastic flavour makes up for its mono-shade. Add the oil, cumin, ginger, garlic, chilli paste and coriander to the pan before throwing in the cauliflower. Add about 1/4 cup of water and allow it to cook gently for 5 minutes. Pour on a little more water before adding the uncooked rice, green pepper and turmeric. Gently simmer while the rice absorbs the water and the cauliflower begins to soften. You’ll need to keep adding water during this process as the pan dries out, just test the rice every so often and prod the cauliflower to judge readiness. While the rice is still a little toothsome, add the mushrooms, peanut butter, garam masala and sunflower seeds. Cook for a further 5 minutes until the mushrooms are soft and the rice is cooked. Add the prawns and cover with a large pan lid for 2 minutes to ensure everything is piping hot. Serve with a spoonful of plain yoghurt or soured cream. Wish me luck – it’s Brussel Sprout night tonight, not even kidding. What are your favourite and most inventive ways to cook broccoli and cauliflower? I am doing meal replacement too, just for a couple of weeks to give me a bit of a boost while feeling a bit impatient on Weight Watchers! Good luck with it Kelly! Both meals look tasty to me! I’ve been doing *almost* the same thing since becoming veggie. Brocolli and cauliflower go into practically everything though since I love ’em! You should try sweet potato and garlic bubble and squeak – loads of veggies and it tastes AMAZING. Thanks! I can’t have too much sweet potato but I adore bubble and squeak so I will definitely boil up any leftovers at the end of the week. Aslong as I can have brown sauce with it though! I’m not massive on cauliflower (it’s OK heavily seasoned and roasted), but I use broccoli in place of rice for most meals. It absorbs sauces really well, so I dump a lentil mash over the top of it and chow down. My fave variation is roast pumpkin and onion blended and cooked with Zucchini and lentils, blended again and mixed with a peanut/chilli/soy/honey sauce. This goes well with chicken too. Happy om-nomming! Yes. Roasted is the way forward! I’ve heard of cauli rice but not broccoli, that’s very cool – I might give it a go. Ooooh, you’ve inspired me, thank you! 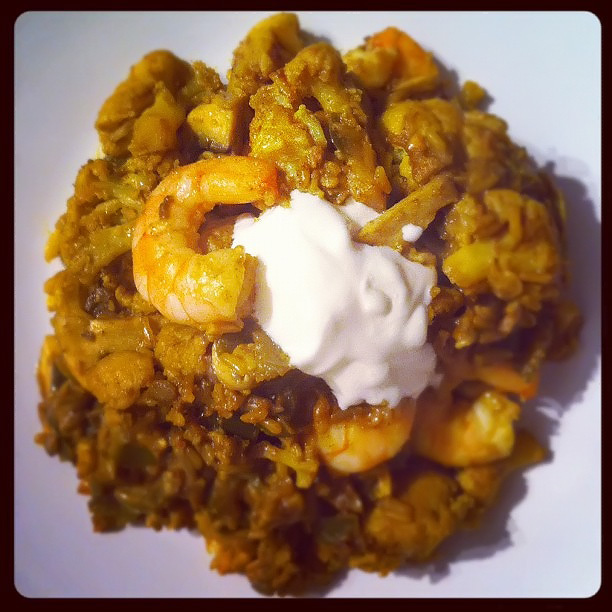 Gobi Masala with cauliflower is delicious, as long as you like spice! And for broccoli, roasted with oil, salt, pepper and garlic for about 20 mins, then mix through a squeeze of lemon juice, more oil, half a handful of grated parmesan and maybe even pinenuts. Yum! The broccoli stir fry looks gorgeous. Cauliflower is the work of the devil though! haha, noooo – I like my cauliflower with a bit of bite! Wow, I hate both broccoli and cauli but your meals make even me want to eat them. Good going! Try celeriac. It’s so yummy and much lower in carbs than potatoes etc. Celeriac is really good cubed finely with an equal part apples, a couple of tablespoons of mayo and a pinch of celery salt (an entire celeriac!). It tastes great on rye bread or alone or with anything, practically. Slightly dessert-y with the apples. How about beets? Also a good potato-substitute! Best of luck, I know from personal experience about dieting…I HATE IT…but I would be curious to know what kind of protein shakes you use/make? Hi Lisa, at the moment – I’m using a Slimfast-esque one called Slimmm but when I finish them up, I’m contemplating making my own with my whey powder and added goodies. No idea how though as I need to make it as nutritionally sound as possible. I might be too late to help with the sprouts, but I highly recommend roasting them with garlic and pine nuts, then sprinkling with lemon zest and grated Parmesan after they’re out of the oven — even my nieces can’t get enough of them like that! Cauliflower and broccoli are two of my favourite vegetables and I’d be hard-pressed to pick a top way to prepare them, but for a quick veg-heavy meal I take cauliflower, sweet potato and French beans (small florets for the first, cubed for the second and diagonally sliced if large/whole if small for the last), pan-cook the cauliflower and potato with garlic, onion and mustard seed until slightly tender, then add a can of coconut milk, the beans, garam masala & salt to taste, and simmer until the beans are done. Serve with some naan or quinoa and you’re ready to eat! Hi Jules! You’re not too late, I wimped out and had beansprouts on day 3 instead! I think I’m gonna roast as you said but I don’t have any parmesan… will have to come up with a compromise! Yay; hope the sprouts turn out well! You can also leave out the sweet potatoes in the second recipe and just toss the beans and cauliflower in the spices with a splash of vegetable broth for a less-lush but still filling meal (or when you’ve run out of coconut milk!). Thanks Klara! I don’t want to introduce noodles yet but LondonMUGirl suggested making “noodles” from something like courgette (zucchini). Also, there’s always spaghetti squash – if I can find it! Girl I totally know how hard this weight business can be. Well done on what you’ve lost so far. I’m not trying to distract you but have you tried Slimming world? I only say so because I did it and I found not really having to count calories and just knowing what i was and was not allowed to eat was so much easier for me. My problem? Portion control. I used to eat like a dude. Could eat my hubby on a bad day and 3/4 nandos was starting NOT to be a problem. I found i didnt have to control my portion control too much on slimming world. I did lose a stack but then I fell preggers and even then I have still lost weight throughout most of my pregnancy. I’m just getting bloated now. I think what helped was the exercise. Is there anything you like? once you find what you like to do everything else will fall in place. I think you’re awesome for trying the vege stuff. I’m such a carnivore. Would never work for me. Praying you see the results you want real soon! I know what you’re saying! Slimming World was actually the worst fit for me. I quite like the calorie counting, it gives me control and MAKES me account for what I eat. I know that food diaries help me, but I never keep them up because they’re such a bore. Calorie counting is like a forced food diary! 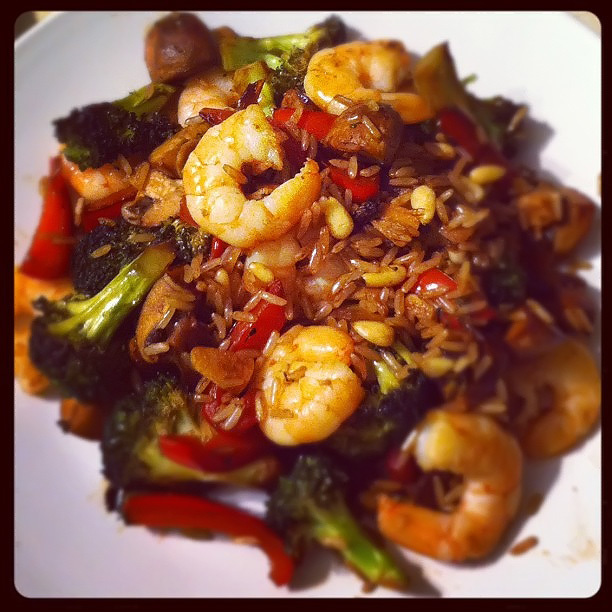 The broccoli stir fry looks delicious! Thanks for the recipe, will give it a try.